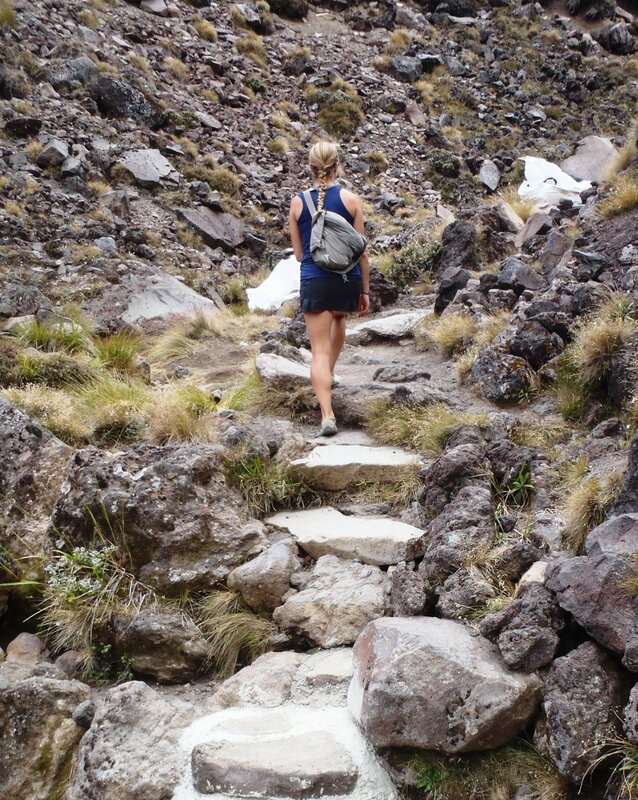 The Tongariro Alpine Crossing is the single most popular “day hike” in New Zealand, and for good reason. It is in an easily accessible location, the terrain is not intimidating and the well-worn path can be navigated by a novice hiker. Tongariro National Park is the 4th oldest National Park in the world and the most popular in New Zealand with up to 1,000 people hiking the 20km track each summer day. 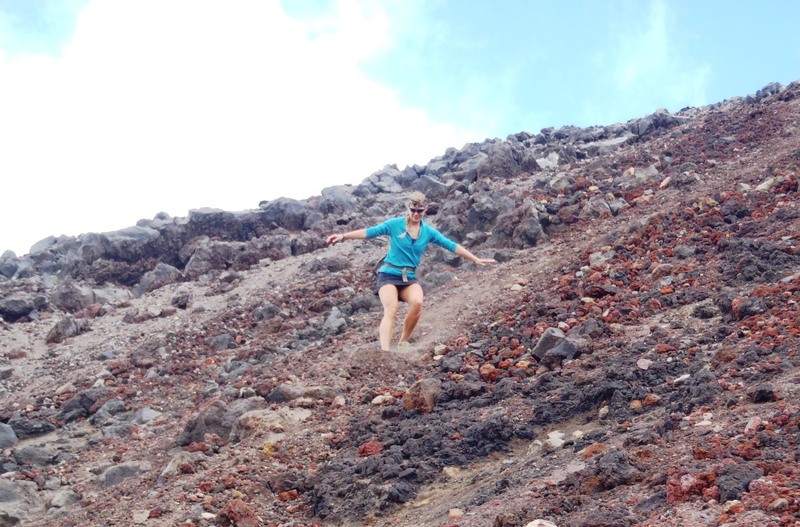 For months Lindsay and I had toyed with the idea of being herded like tourist sheep and jumping in a line of fellow Tongariro day hikers to get the nature experience. For me, a valuable nature experience is not from a tour bus, nor a guided ship, nor a line of other people for 6 hours, so because of this we avoided doing the crossing… despite it being the quintessential NZ tourist experience. 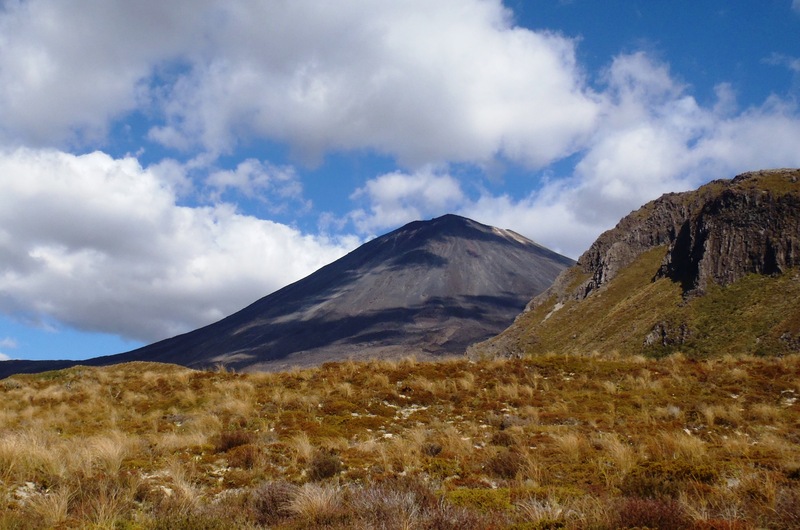 Well, to make a long story short, we read about an alternative to the norm which peaked our interest: we could go to the start of the traditional Tongariro Crossing and cut up an unmarked trail to summit Mount Ngauruhoe, better known as Mt. Doom from The Lord of the Rings Trilogy. Lindsay moving up the incredibly well maintained trail. True to our standard practice, we started two hours later than we had planned on. This resulted in the unintended consequence of a relatively empty walking trail; we were much later than those who were hiking the 20km and catching a shuttle back to the parking lot. The beautifully sunny day, sparsely populated walking path and well manicured trail gave all the signs that we had picked the perfect time to go hiking. The only drawback? The weather… Our destination, the summit of Mt Doom, sat in a thick layer of unmoving, unthinning and unlifting fog. 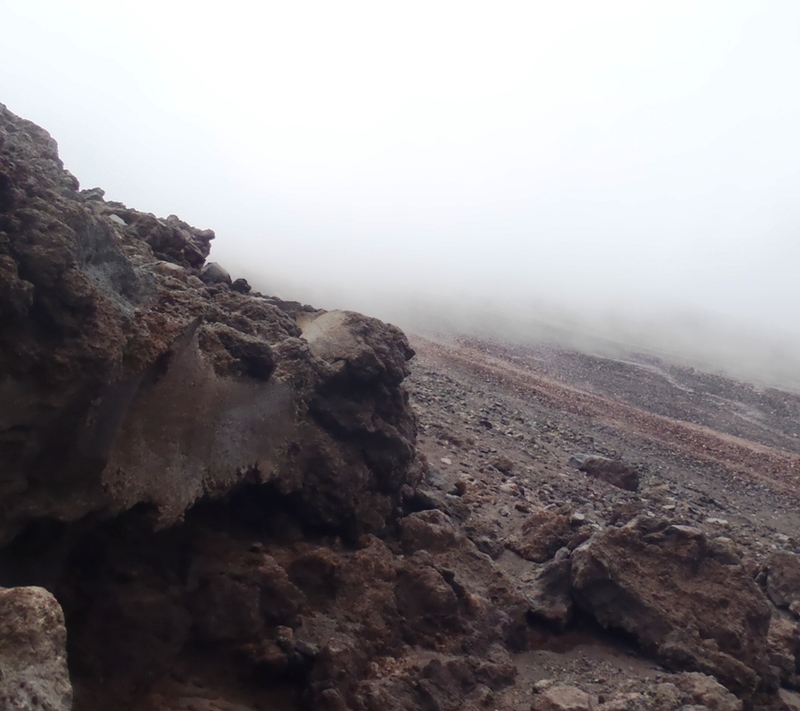 After two hours of walking to get to the base of Ngauruhoe (Mt Doom) the fog hadn’t moved. 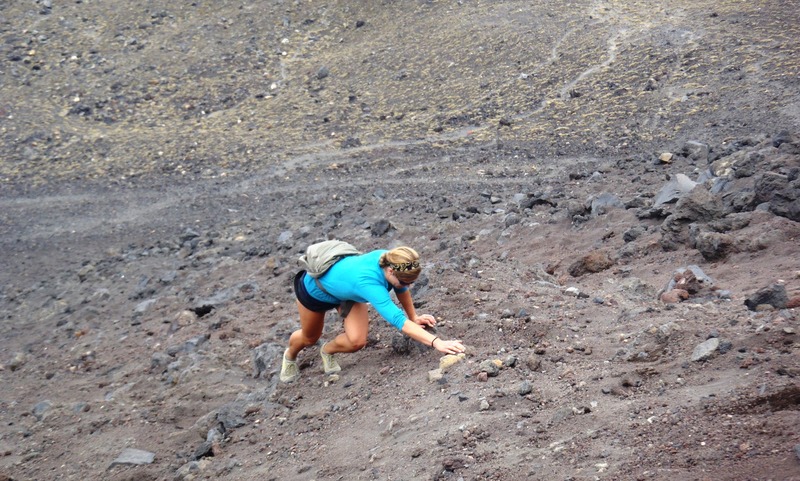 Lindsay climbing up the volcanic scree, hand over hand! “Well, lets start going up anyway, we didn’t come this far to just turn around.” Famous last words? We started up the completely raw “path” that lacked markers or any trail improvement (a very non-Department of Conservation (DOC) thing to do). So what is it like to climb up Mt Doom you ask? 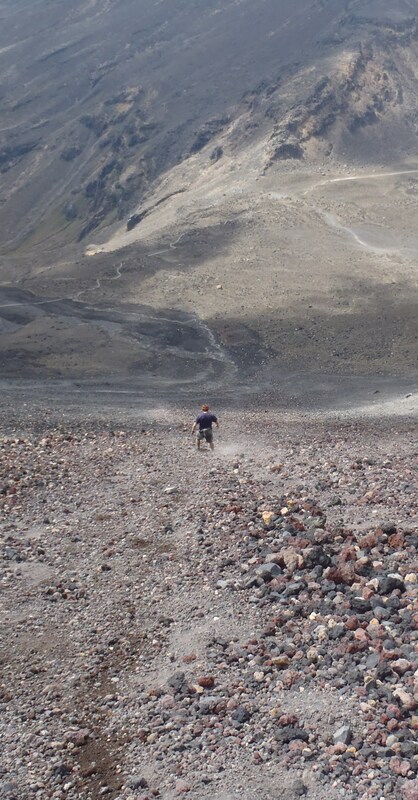 Well, it’s a 600m path up a mountain made up solely of loose tephra, which is just a fancy geologist term for miserable, sharp, unstable volcanic pebbles that somehow hold a 40 degree slope. Every step forward is like trying to climb up angled beach sand and is only completed by being on your hands and knees. To be perfectly honest, I don’t know the words to eloquently describe how much it sucked to scramble up this mountain. It’s about 2.5 hours to hike the 6km to the mountain base. It’s 1.5 hours to climb the 600m to the summit. We eventually hit the cloud level and decided to stop for lunch, just hoping that these clouds would clear while we were on our break. They did move, unfortunately they moved down the mountain… We tried to keep climbing into the fog and came to a stop when we realized that the uniquely beautiful Afghanistan-like scenery of the Tongariro Crossing below was no longer visible and we still couldn’t see the summit. To make it worse, the dark, thickening clouds felt oddly like oncoming rain. “Okay, let’s just be grown-ups about this situation. Climbing this hill [stinks] and we can’t even see anything…we can’t see how far the summit is above us, and we can’t see any of the views below us. It’s already late in the day and it could get crappy and rain at any minute, which would make this hill treacherous. Lets do the smart thing and just head down to the car instead of being stupid.” Well with this logic we decided to head down the hill, I have to admit was the funnest of the whole trip! You could “ski” down on your feet faster than you could run and as long as you kept your balance you could slip and slide for a hundred meters at a time, in a matter of minutes. We paused after just 5 minutes to see how far we’d descended. What did we see? What happened as soon as we were about halfway down the mountain? The clouds lifted! Yep. We quit and headed down the hill and looked up just in time to see the clouds finish lifting to expose the summit against a crystal clear blue sky. Clay, about halfway down from the turn around point. Very Afghanistan-esque terrain. By the time I looked back to Lindsay and saw the gut wrenching scene of the beautifully clear summit, we had already given up about an hour of vertical progress and it was truly too late in the day day to turn around. We quit. I allowed us to quit. I quit. It got hard, I was uncomfortable and I quit. If there was one thing that I regretted about the 6 months we spent in New Zealand, this was it. I talked myself into the easier option, simply because it was just that, easier. I allowed myself to accept quitting. Most of the walk back to the car was in silence. The whole walk back to the car I chewed on what just happened, because it was much more the principle of the matter rather than the course of events. Many of the things that I have accomplished in my life, especially since leaving for Norwich University, were because of a fear of failure and a massive aversion to quitting. A psychologist would probably have a dozen things to say about how that will negatively affect me in life, but I think it has worked well so far. Lindsay ‘skiing’ down the side of the mountain. Super fun! 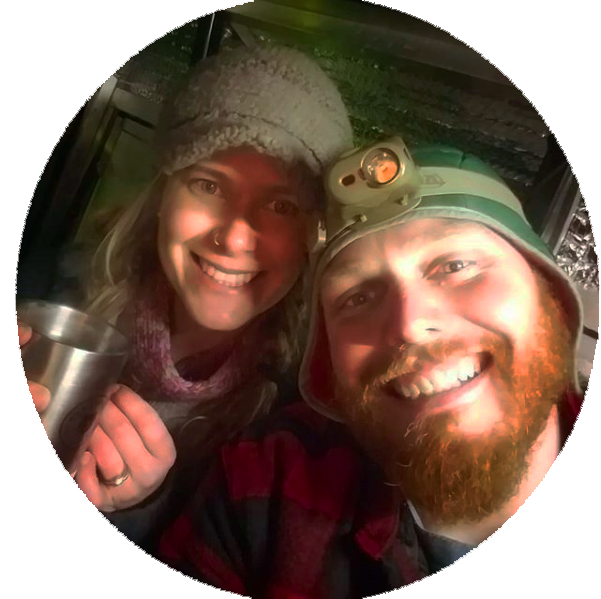 I really let myself down that day, but looking back it may be the most important part of prepping for the Appalachian Trail. It had been at least 6 months from this hike since I had last really pushed myself, be it physically or mentally, and the bitter taste of defeat is something that I hadn’t had in a much longer time… prior to Mt. Doom. I plan on going at least that long without that sense of disappointment again! The skies remained blue above Mt. Doom the rest of the day with 360 degree views from the summit. Mount Ngauruhoe. Mount Doom. Blue skies. 360 degree views that we didn’t see.